The ultimate animated space opera! This was no ordinary cartoon series... in most cartoons there was a theme particular to each episode, a different enemy, etc. In Star Blazers, you meet the characters at the beginning of the series and watch their personalities develop through three major sagas. The first two are 26 episodes in length and the third is 25 episodes. Throughout the series, the characters find themselves at war, not only with their main enemies Desslok of Gamilon and Prince Zordar of the Comet Empire, but amongst themselves as well. In time, these rivalries fade and relationships form between some of the major characters. 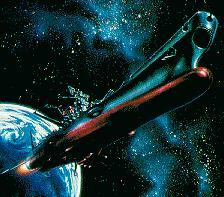 The above description came from Star Blazers/Space Battleship Yamato Home Page! and, and was edited by yours truly (contact me).